The 4R Nutrient Stewardship Certification Program has announced that the Mid-Wood, Inc. Bascom facility has been added to its growing list of nutrient service providers to achieve certified status. The voluntary certification program, now in its fifth year, is a concentrated effort by the agriculture industry to significantly reduce and prevent applied nutrients from running off fields, which has contributed to water quality issues in Lake Erie and other waterways across Ohio. Bascom Fertilizer started as part of Bascom Elevator & Supply Cooperative. 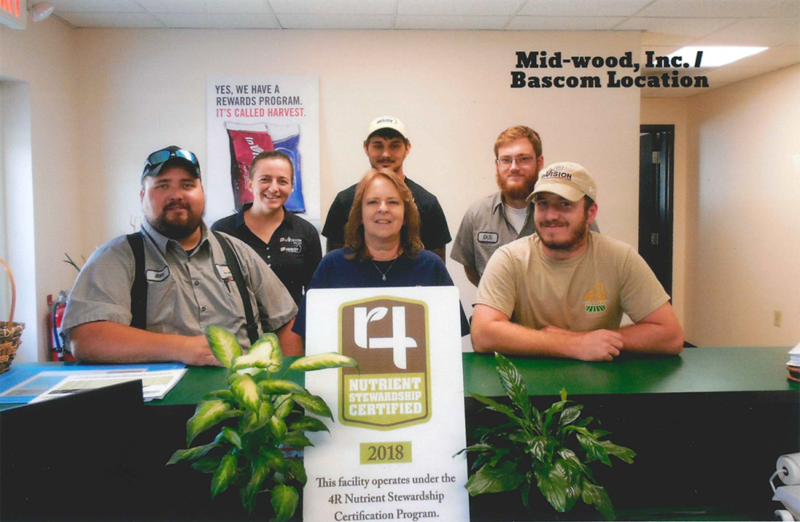 After Bascom Elevator’s 100th anniversary in 2013, the facility merged with Mid-Wood, Inc. Mid-Wood Bascom provides fertilizer needs, crop protection products and custom services, grid sampling, tissue sampling, VRT spreading and all seed needs, including cover crop seed and information. “The Nutrient Stewardship Council is proud of Mid-Wood Bascom facility’s efforts in earning certification in this voluntary program, ” said Andrew Allman, executive director of the NSC. CUTLINES: Mid-Wood, Inc. Bascom facility is now 4R Nutrient Stewardship Certified. Employees pictures (from L to R) include: Front Row – Jeff Fox, Salesman; Susie Coppus, Branch Manager; John Agin, Certified Custom Spray Applicator/Fertilizer Applicator. Back Row – Jessica Wasserman, Office Manager; Jordan Weissinger, Certified Fertilizer Applicator/Custom Spray Applicator; Gus Falgner, Certified Crop Adviser.